STB Dual Head Miter Saw w/ Power Feeds, 70” Left and Right of Center. Sampson mdl. MN15012 Miter Corner Saw s/n 4665 w/ Hydraulic Feeds, Fence System. Delta 12” Vertical Band Saw. CTD mdl. F426 16” Cutoff Saw w/ Pneumatic Clamping and Feeds. Safety Speed Cut mdl. H6 Panel Saw s/n M87. Hitachi 14” Miter Saw w/ Table and Fence System. Rockwell 24”Scroll Saw w/ Roll Stand. Ingersoll Rand mdl. U15H 15Hp Rotary Vane Air Compressor w/ 120 Gallon Tank, 1540 Metered Hours. Swanco 5Hp Vertical Air Compressor w/ 60 Gallon Tank. Lincoln Squarewave TIG175 TIG Welding Power Source s/n U19809091. Acme mdl. 1-24-20 20kVA x 24” Spot Welder s/n 7210. Loctite “Bond-A-Matic2000” Automatic Glue Dispensing System. Rockwell / Delta 2-Head Gang Drill Press w/ mdl. 17-600 Heads, 24” x 36” Table. 6” Belt / 9” Disc Sander. Aluminum Sign Box Frame, Side Cover, Edge Molding, Sheet Stock, 36” x 120”, 23” x 43”, 22” x 42”, 18” x 36” , 18” x 24”, 12” x 24”, 48” x 96” x 1/8” Plexiglass Sheeting. Elda mdl. 3515 350kG (771 Lb) Cap Electric-Hydraulic Lift. Weldex “Lift Man” Manual Lift w/ 6’ Height Extension. (7) Pallet Racks, Storage Shelving, Work Benches. Signode mdl. MCD-700 Power Strapping Machine. Engel mdl. DH-1240 Double Edge Roll Forming Machine s/n 501-81 w/ 12-Roll Roll Forming Heads, 60” Sheet Cap. Maplewood 9-Roll Double Edge Roll Forming Machine s/n 103G924 w/ 50” Cap. Lockformer 10’ x 18GA Power Slitter Table s/n 1041 w/ Power Gaging, Pneumatic Clamping. Wilder mdl. 1624 24” x 16GA Power Slitter. Norlok mdl. FMDSL-181 “Sure-Lok 18” Fastener Insertion Press s/n 99087. Gripnail mdl. 460 Auto Nailer / Fastening System s/n 2053 w/ 62” Throat, Bowl Feeder. Lockformer 9-Roll Triplex S and Drive Roll Former s/n TRI2858. Lockformer 22GA 9-Roll Triplex Roll Former – Cleatformer s/n TRI2171. Flagler mdl. H-2 ½-7 16GA 7-Roll Roll Former s/n H-2 ½-7-1681293-99 w/ 16-20GA Stand Seam, 22-26GA Tap-In Lock. Flagler QF mdl. 2201 10-Roll Roll Former. Lockformer 22GA 9-Roll Roll Former s/n TRT-FS-5428 w/ Snap-Loc Tooling. Lockformer 20GA 9-Roll Button Lock Roll Former s/n BL1185. Lockformer 20GA 9-Roll Button Lock Roll Former s/n 4353. Lockformer 24GA 9-Roll Roll Former s/n 99954. Lockformer 20GA 5-Roll Roll Former s/n SS2877. 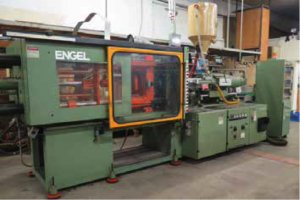 Flagler 20Ga Cap Duplex Head Roll Forming Machine s/n DH2510 1273. Lockformer 20GA 5-Roll Super Speed Pittsburgh Roll Former s/n SS1082. Lockformer 20GA x 120” Residential Notcher s/n PN1100 w/5-Notching Heads. 82” 5-Head Notcher w/ 24” x 80” Table. Nor Service PGP 15-Hole – 24” x 24GA Powered Gang Punch s/n NOR-PGP-039. Rafter Machine Co. mdl. W1A Rollock Flashing Machine s/n 2643. Welty-Way mdl. HB18-2 18GA Cleat Bender. (3) Welty-Way 16”, 14” and 8” Prototype Collar Machines.